at the prospect of democracy in the House of Lords. The United Kingdom is not a proper democracy. This is indisputable for many reasons, the existence of a monarch with the power to dissolve parliament, an electoral system that renders the votes of millions of people utterly worthless and most importantly the undemocratic shambles that is the House of Lords. The idea of a completely unelected upper house would be utterly incomprehensible to residents of many other countries. Admittedly democratic systems across the world suffer from their own specific defects but the idea of an unelected Senate would be shocking to most people in France, Germany, Italy or the United States. The votes of around 40,000,000 Brits determine the 650 representatives in the House of Commons yet the 789 members of the House of Lords have been selected by just 9 men and 1 woman since the introduction of the Life Peerages act in 1958 (see table below). At first the Prime Minister selected life peers to top up an upper house stuffed with hereditary peers who had simply inherited their positions of power and authority from their fathers. Before the 1997 General Election Tony Blair promised House of Lords reform but only carried out half of it removing hundreds of Tory Hereditary peers in 1999 but failing to bring in a proper democratic replacement in favour of stuffing the place with 357 of his hand picked unelected political stooges. Since 1999 the selection of unelected life peers has been an important part of a Prime Minister's job allowing him to alter the balance of power in the upper house to suit his own interests. This is best illustrated by the fact that David Cameron created 116 life peers in his first year in office, nearly ten times the rate of Tory predecessor Alec Douglas-Home who created only 14 life peers in his one year stint as Prime Minister between 1963 and 1964. Before the 2010 General Election all three major parties committed themselves to introducing some democracy to the upper house in their manifestos however the overwhelming majority of the unelected rabble that are famously allowed to claim expenses just by signing in and doing absolutely nothing else are obviously strongly opposed to any kind of democratic reform. 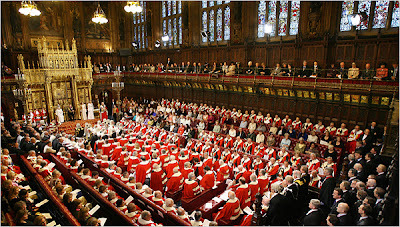 The current unelected peers will almost certainly vote down any proposals to apply democracy to the upper house and some have even claimed that use of the Parliament Act to impose reform would be "unconstitutional". 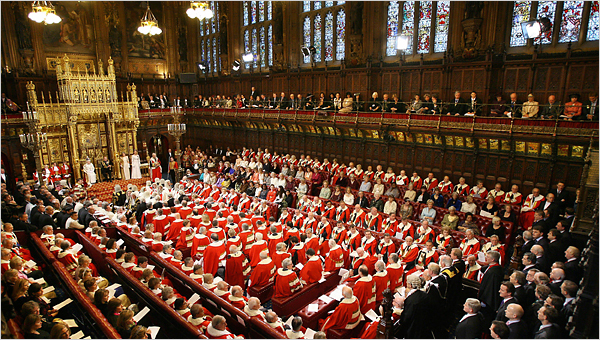 They know as well as anyone that the United Kingdom has no written constitution and that the Parliament Act has been used before to prevent the undemocratic Lords from sinking legislation from the less undemocratic Commons. It is quite pleasant to know that these horrible unelected political stooges are getting so upset at the prospect of losing their power, influence and expenses however this feeling is tainted by the knowledge that they will just be replaced by another tier of corrupt, dishonest, self serving career politicians wearing the rosettes of the three main political parties in the UK, Neo-Liberal Blue, Neo-Liberal Red & Neo-Liberal Yellow. 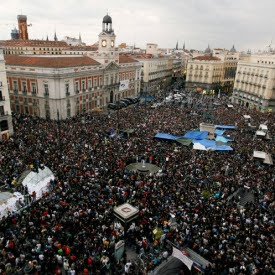 in the hands of the politicians & bankers"
Over the last week the Puerta del Sol square in Madrid and city squares across the rest of Spain have been occupied by protesters in what the local media have begun referring to as the second Spanish revolution. With local elections looming the Spanish electoral commission declared the protests illegal late on the Thursday and placed a ban on the protests over the weekend. However the demonstrations that began on May 15 continued to grow in popularity and spread across Spain (from the Balaeric islands to Barcelona) and the rest of the world with small protests cropping up across the European Union as well as in the United States and Latin America. The protests were originally organised by Democracia Real Ya (real democracy now) but grew in appeal to a broad spectrum of people across Spanish society who began to refer to themselves as "los indignados" (the indignant). Social networking sites such as Twitter and Facebook played their roles. The Twitter account @Acampadasol gathered over 40,000 followers in a week and many of the local protests had their own dedicated Facebook pages. Even after a week of protests across Spain the 15M movement had yet to set out any demands, claiming only to oppose the corrupt and unfair political system that allows over 100 politicians accused of corruption to stand in the upcoming elections, has allowed unemployment in Spain to rise to 21.2% (44.6% amongst the under 25s) while working hard to protect the interests of the bankers, businessemen and the economic elite. The 15M protesters are particularly unhappy that the current electoral system is rigged to offer the choice between only two parties; the nominally left-wing PSOE and the right-wing PP. As in Britain both parties have dropped many of their traditional policies in favour of pan-European neo-liberalism and the Spanish electorate recognise that a vote for either of the main parties represents a vote for the continuation of exactly the same corrupt, banker friendly, neo-liberal agenda. Opinions in Spain are clearly divided, with the majority of progressives stating that this movement is long overdue, expressing relief that the youth have finally awoken from their apathetic slumber, claiming that the 15M protest unites people from across the political spectrum and hoping that these will become truly historic events. Reactionaries like Emilio Benítez claim that "most of the protesters are obviously left-wing extremists and anarchists, who wish to destabilise the democracy that took so much effort and time to achieve". Other right-wing groups have made outlandish claims that the protests are funded and organised by the paramilitary terrorist organisation ETA. Many media commentators have drawn comparisons with the popular uprisings across the middle east making outlandish claims like "the Arab spring has arrived in the west" however many protesters are keen to draw a distinction between the bravery of the protesters in the middle east who have risked their lives in order to protest and the largely peaceful demonstrations across Spain. Translation: "No house, no job, no future. No fear"
The ruling PSOE are referred to in the Spanish media as "the socialist party" although their policy of massive job cuts, austerity measures and protection of the banking sector following the credit crunch and the collapse of the Spanish property market in 2008 are far removed from any definition of socialism I am familiar with. Their policies actually seem to be driven by fear of the global banking elite (European Central Bank, IMF, World bank & the credit ratings agencies) who between them have been capable of bringing entire countries like Greece, Ireland and neighbours Portugal to their knees. 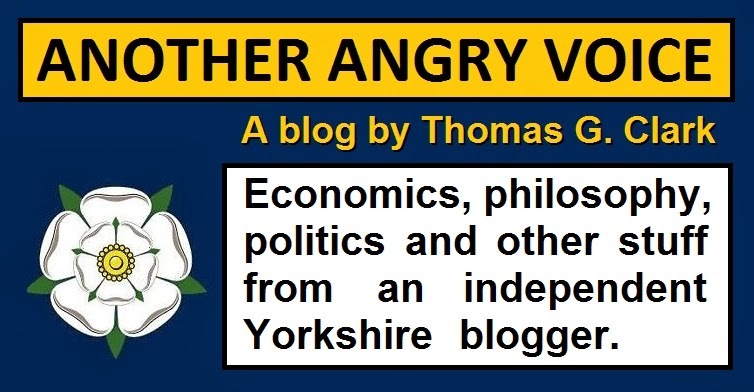 The policy seems to be to smash the poor with job cuts and destruction of services and infrastructure before the austerity measures are imposed from above by the European Central bank or the IMF. The cuts proved hugely unpopular, especially given that Spain has the highest unemployment levels in the western world as a consequence and as a result the right-wing and even more banker friendly PP made massive gains in the mayoral, local and regional elections. Of the many issues that have been raised in these protests the most important seems to be anger at unfairness in both the Spanish electoral system and across the rest of Spanish society. The electoral system offers only the choice between two neo-liberal parties who have little real control over the Spanish economy having ceded most of their powers to the undemocratic shambles of the European Union and the European Central Bank and favour the interests of the rich above the needs of the young and the poor. José Luis Sampedro's view of the situation. 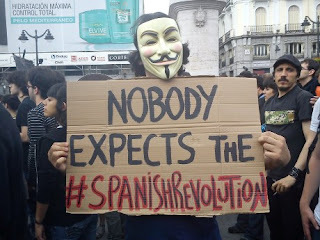 Coverage of the demonstrations across Spain is dominating television news. As a Brit witnessing all of this it is quite a clear demonstration that the UK population is quite clearly much more conservative and reactionary than the Spanish given that the UK referendum to introduce a slightly fairer voting system was defeated earlier this month as the people voted overwhelmingly to support the interests of the forces of political conservatism, while in Spain the people have taken to occupying their town and city squares in order to call for a fairer and more representative political system. It is not that the British are entirely unaware of the issues after the credit crunch and the Parliametary expenses scandal bankers and politicians are pretty much universally despised in the UK, however people are so naive and politically conservative that they will vote against reform despite the fact the the biggest beneficiaries are the politicians and bankers that they despise. The biggest winners from the AV no-vote were the Tory party that take more than 50% of their donations from bankers in the city and have imposed harsh austerity measures on the young, the poor, the sick, the elederly, the diabled, the unemployed and anyone that uses public services whilst doing virtually nothing to reform the banking system that caused the economic crisis in the first place. The media reaction to the protests is also very different to what would happen in the UK, with coverage of the demonstrations taking up the majority of the news on all channels, whether in the form of blanket condemnation and misinformation from the right-wing media to the less partisan coverage offered elsewhere the media are actrually talking about it unlike in Britain where huge demonstrations over the last decade have been talked down or written out of the news agenda entirely. Another big difference is the relaxed attitude of the police in response to these now illegal demonstrations, who have not resorted to the kettling, containment, oppression and violence of the British police when faced with perfectly legal ones, allegedly preferring the underhand tactics of undercover police removing demonstrators under the cover of night. Perhaps the legacy of Franco's brutal oppression of dissent is working as a constraint as there would be fewer more politically harmful images than the Spanish police violently oppressing peaceful protests in clear daylight being broadcast across the country. It is pretty much impossible to see a resolution to the crisis that will satisfy the demonstraters, given that any wavering from the government on their austerity drive would result in economic punishment from the global banking elite in the form of lowered credit ratings and externally imposed austerity measures. 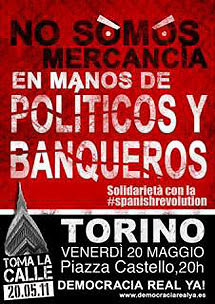 Spain could not escape the wrath of the bankers were they to decide to nationalise their banks, invest in "new deal" style employment and infrastructure schemes and reform their political system to allow alternative parties fairer representation. The problem is not just a Spanish one, the global banking elite have created themselves a vice-like grip on the global economy and it will take more than just a few reforms in a medium sized European country to prevent them from holding entire nations to ransom. How the World Works: Part 2 - British turkeys vote to keep Christmas. On 5 May 2011 around half of the British electorate went to the polls to vote in local and regional elections and had the chance to vote in only the second referendum ever in the history of the United Kingdom. The choice they faced was whether to replace the outdated and hugely disproportionate voting system with a slightly less bad alternative or to stick with the status quo that had allowed unpopular political parties to form absolute majorities in the House of Commons with as little as 35.5% of the vote (on a 61.4% turnout that equates to the support from only 21.8% of the UK population). The NO2AV campaign was heavily supported by rich Tory party members, the super rich bankers that provided more than half of the funding to the Tory party and the majority of Britain's notoriously right-wing media. The campaing had two simple objectives, to sling as much misinformation about as possible and to associate the Yes campaign with the incredibly unpopular leader of the Liberal-Democrats, Nick Clegg. The reason that Clegg had become such an unpopular figure is the fact that he had ditched some very high profile progressive Lib-Dem policies in order to act as enabler for one of the most reactionary, spiteful and right-wing governments in British history led by the Tories. Despite a recent history of political corruption and a huge public upswelling of anger against the bankers that fund the Tory party, the NO2AV campaign succeded and the British public voted overwhelmingly against political reform in order to spite Nick Clegg. In doing so they handed a resounding victory to the right-wing politicians and super rich elite that they despise Nick Clegg for enabling. If you enjoyed this post, maybe you could buy me a beer? £1 would get me a can of cheap lager whilst £3 would get me a lovely pint of real ale.